We are a small cattery in beautiful Savannah, Georgia. 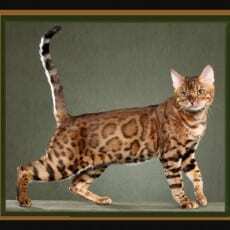 We breed beautiful Bengal cats for sale as pets, breeders and potential show cats. We started out as Bengal cat owners, but fell in love with the breed, so much so that we wanted to see how we could contribute, and hopefully improve the Bengal cat breed. That’s how we became a Bengal breeder. We breed Snow Bengal kittens, Bengal Leopard kittens, Marble Bengal kittens and Silver Bengal kittens. Our Bengal cats and kittens are showered with love and attention from day one. We spoil our Bengal cats and kittens, giving them plenty of hugs, kisses and affection. We firmly believe that they deserve the best of everything, whether it be their food, toys, or beds/blankets. We also socialize our Bengal kittens at an early age. Our kittens are handled with lots of gentleness, love, and care from the day they are born. Boyds Bengal kittens are born in the “kitten nursery” and when they are old enough, they go to the “kitten room” after which they are introduced to the rest of the house, to play with the older cats. The Boyds Bengal experience does not end with your purchase of a Bengal kitten. We provide ongoing support to all our clients, and welcome phone calls, emails and communications from our clients. We try and develop personal relationships with all our clients, and welcome your letters and email updates about your Boyds Bengal. We keep keep our Bengal kittens with us, until they are at 12 weeks old, to avoid behavioral problems associated with kittens being separated from their litters too soon. At that time, they will have had their shots, been dewormed, been fully weaned from its mother, begun eating solid food and using the litter box. We also want to ensure that our kittens are socialized at that point to interact with their new family, including children and pets. We want our Bengal kittens to go to good, loving homes where they will receive lots of love, attention and excellent care. 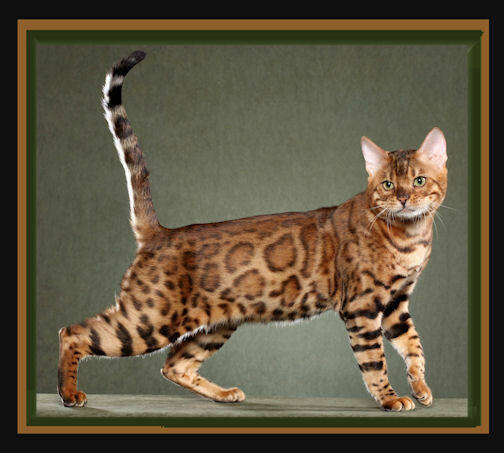 We will be happy to help you choose the Bengal cat that is “just right” for you. Please check back frequently to see our latest litter of Bengal kittens or Bengal cats for sale in our Gallery! Please contact us directly to find out about our Bengal cat prices and Bengal kitten prices. Should you need more information about our Bengal cats, including prices for a particular Bengal cat or Bengal Kitten, a Brown Spotted Bengal for Sale, a Silver Bengal or a Snow Bengal for sale, we welcome you to contact us.